The Australian Oil and Gas show in Perth is proving to be a real success for maxon motor and National Instruments who have teamed up to display a complete range of motors, drives, and embedded monitoring and control equipment. In particular the new range of brushless DC motors that have been designed to combat extreme temperatures and the high vibrations of downhole drilling applications. So far on day two we have found solutions for application requirements from subsea valves and mud pulse equipment right through to railway instrumentation and cable tensioning. The motor is providing a long sought after off the shelf solution for oil filled and even vacuum environments. We are experiencing a truly global event with customer visits from Italy, USA, The Netherlands and Scotland amongst others. 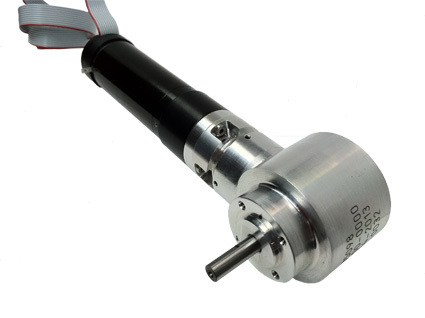 New: Small DC servomotor with high resolution encoder and planetary + spiroid gear combination. Contact maxon motor Australia for further information or assistance. Downhole DC motors and gearheads at the AOG exhibition. maxon motor Australia will showcase a range of Heavy Duty motor and gearhead products at this years Australasian Oil and Gas Exhibition in Perth this February 20-22nd, stand A13. The HD brushed and brushless DC motors newly developed by maxon motor are designed for use not only in down hole directional drilling but any application with an extreme environment. The DC motors have been equipped for use in free air, vacuum or flooded in oil, and even at temperatures beyond 200 degrees. They have been used at depths of over 2500m, can withstand pressures of to 1700bar, impacts 100G and vibrations of 25 Grms. The motors are phenomenally powerful for their size and the ability to be used as a submerged motor also makes them very suitable for many ROV and other subsea applications. As such maxon motor will be in the subsea section of the exhibition with many of its existing customers also as exhibitors. Again this year we are aligning our selves with National Instruments who have a range of products that compliment maxon’s. Information on the National Instruments hardware and software products that can be used with maxon motor control units can be found on the maxon motor website and vice versa. The show this year is set to be bigger and busier than ever with over 11,000 visitors and 460 exhibitors. It is Australias largest oil and gas exhibition with exhibitors from over 20 countries with product applications from robotic welding robots to measurement while drilling (MWD) technologies. Contact maxon motor Australia for further information. Latest Generation DC motor position controller upgrade. Maxon motor today released software and firmware upgrades for their range of motion control units. The EPOS (Easy to use Position system) versions EPOS2 EPOS2P and EPOS3 are affected. Some of the upgraded features for the EPOS3 include an implemented touch probe functionality, Cyclic Synchronous Position Mode (CSP) featuring improved interpolation of target position and enhanced EtherCAT error handling communication. The EPOS studio software suite now includes an automatic firmware scan at startup, a new graphic design, registry free components, improved gear configuration in the startup wizard and detailed information in the EtherCAT protocol in the Command Analyzer. The EPOS2 DC motor position control unit has new command functions such as Get Home State, Wait for Homing Attained, Get Average Velocity and Get Average Current. All new position controllers will be supplied with the new firmware version and the version numbers will be included in the deliveries. For detailed information or assistance visit maxon motor Australia www.maxonmotor.com.au or contact maxon motor in Sydney on +61 2 9476 4777. KAG announce alliance with maxon motor. Kählig Antriebstechnik GmbH have appointed maxon motor Australia Pty Ltd as their distributor for Australia and New Zealand. KAG of Hannover have over 40 years’ experience manufacturing high quality brushed and brushless DC motors. KAG manufacture a range of standard motors, gears and accessories in a versatile modular system with the aid of an online product configurator. They also excel in producing customised solutions for industrial automation, building automation and specialist applications such as pump drives for axle cooling systems, oil pump motors for hybrid cars, wheelchair loading systems, conveyor systems and a range of motors for doors, turnstiles and blinds. maxon motor AG Switzerland have been a global leader in the highest possible quality miniature and micro drive systems since 1961. The precision and performance of maxon motor products has led to their use in the most demanding applications from the mars rovers to downhole drilling 5km below the earth’s surface. The perfect match. With the combined product range of KAG and maxon motor there is now a solution for almost any application area. This complete motor range is supported by an electronics suite that allows full motion control system integration. Clyde Space are exploring opportunities using Nano-satellites controlled by brushless dc motors from maxon motor.